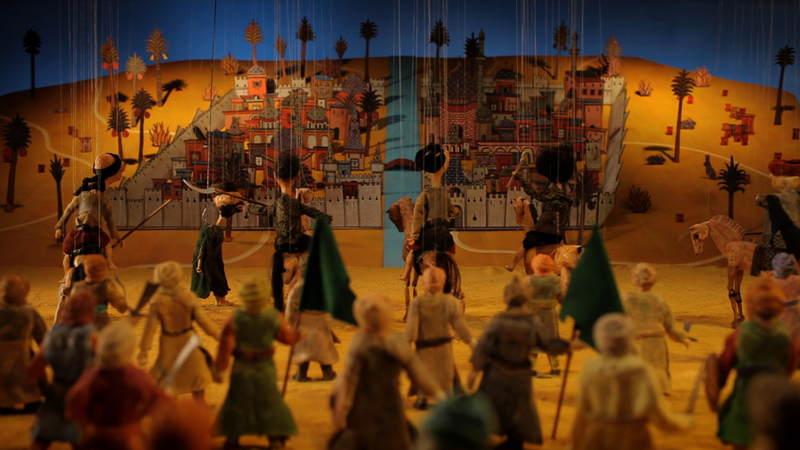 4000 years after their first use in Egypt, Wael Shawky has made marionettes a central part of his art practice, spooking the viewer with what some say is the oldest form of theatre. These puppets are not found objects. The artist has them made using glass and ceramic to render a cast of plenty, in period dress, who range from ethnic caricature to alien xenomorph. As destructible as a truce, these include more than 100 hand-blown glass marionettes made by the maestros in Venice, a city with its own minor role in the crusades. Shawky’s theme here is the millennium-old strife between Christianity and Islam or, more accurately, between Islam and Christianity. After all, those of Islamic faith were on home turf. But the drama is inspired by Arab accounts of the 11th and 12th centuries, when invading knights from Northern Europe waged a war – of varying degrees of holiness – in the Levant. Whether or not this grim moment appears in Cabaret Crusades, I can’t say. The new show in Doha is beyond my usual patch. But even on film, you sense these puppets are capable of anything. And this. As the 9th century rolled around, Baghdad was the most powerful and civilised place on earth with 1,000 physicians, free healthcare, regular post, working sewers and good water supply. The early Iraqis even had global banking, with several overseas bank branches in China. That’s kind of mindblowing, whereas what the invaders had was apparently chainmail and brutality. Such factoids are on almost every page of the book mentioned by Shawky in generous interviews: The Crusades Through Arab Eyes by Amin Maalouf. It’s highly recommended. Art also figures in this reprehensible past. Upon witnessing the siege of Acre in 1189, historian Ibn al-Athir reports the use of a painting of Muhammad beating Jesus: “to incite people to vengeance”. Cabaret Crusades is unlikely to inspire fanaticism on either side. But what the puppets may well tell you clearly that history is full of treachery, intrigue and reversals of fate. So if in recent years you’ve been surprised or indeed exasperated by inconsistencies in US and UK foreign policy, look upon these fragile, mutually dependent figures and realise it was every thus. Wael Shawky: Cabaret Crusades and Other Stories can be seen at Mathaf: Arab Museum of Modern Art, Doha, until 16 August. This interview with Shawky and clips of the action is well worth a look.